As more and more climate-ravaged communities are forced to relocate by droughts, floods and superstorms, the business of fortifying borders is booming. 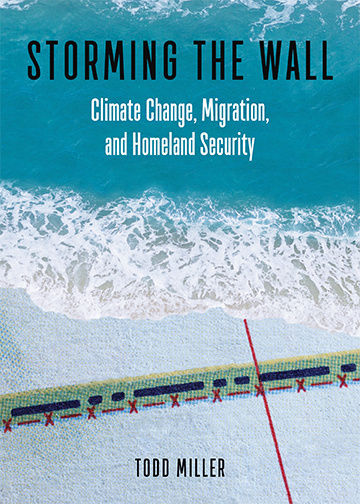 In his new book Storming the Wall: Climate Change, Migration, and Homeland Security, Todd Miller travels around the world reporting on the corporate border militarization cash grab, and the emerging movements for environmental justice and sustainability. Make a donation to Truthout to order this important book today! In the following excerpt from Storming the Wall, Todd Miller discusses how climate disruption impacts the militarized border zone between the United States and Mexico. If Ismael, Luis Carlos, and Santos Fernando ever reach the border of the United States, the world’s largest greenhouse polluter, they will come face to face with the world’s largest border enforcement apparatus. Walls of different shapes and sizes stand waiting for them in urban border areas such as Nogales or San Ysidro or El Paso, places poised to become even more barricaded during Donald Trump’s presidency. Also there to meet them are an army of Border Patrol agents in roving patrols on horseback, in Blackhawk helicopters, in fixed-wing aircraft, and at the controls of Predator B aerial surveillance systems. Depending on where they attempt to cross, they might encounter tethered surveillance balloons or any of hundreds of remote or mobile video surveillance systems strategically positioned to alert Border Patrol agents of their movements. If they cross into the United States, they most likely will do so through a region much like Organ Pipe National Monument, a remote area in in southwestern Arizona where I stood talking to a US Border Patrol agent. As the agent and I talked, we were surrounded by protected wilderness badly scarred with tire tracks by roving Homeland Security trucks whose national security mission trumps environmental protection. The agent, who wished to remain anonymous, knew nothing about climate change becoming a greater planning priority for both the US military and the Department of Homeland Security. He did know, however, about how border enforcement looks from ground level at a Forward Operating Base. Like those deployed in US military operations in Iraq and Afghanistan, the strategy of a Forward Operating Base is to seize ground and maintain a presence in isolated areas and territories. There are now dozens of such bases in the US-Mexico borderlands. When I met with the agent I was with students of a border studies class from Prescott College. The agent was off-duty, wearing a blue shirt, a little bit out of breath because he had been jogging. When we asked the agent what duties are performed at the desolate base his response was: “Depends how busy we are. Sometimes we’re busy finding bodies.” He paused. “Did you find any bodies yourself?” I asked. “I found one,” the agent said, then looked at his shoes. Besides the more than 6,000 remains found along the US Mexico border since the 1990s, the Colibri Center for Human Rights has records of 2,500 additional missing people last seen crossing through the region. In the climate era, coexisting worlds of luxury living and impoverished desperation will only be magnified and compounded. On one side are not only the super-rich who will want to continue to consume, possess, and waste without limits. There are those of the middle class, too, who populate US suburbs and cities and live unsustainable consumer lifestyles. Behind the Border Patrol agent are solar panels that supply energy to this small base, part of Customs and Border Protection’s effort to cut down greenhouse gas emissions by 28 percent, a practice that has continued under the Trump administration. Where we stood, the whole place seemed like it could be part of an active war zone in Iraq or Afghanistan, with the Forward Operating Base threatening to pounce — as Captain Goudreau put it at the Washington climate change national security conference — with the “lethality” of green energy. The Department of Homeland Security’s overall mandate, per an executive action by the Obama administration in 2009, is to reduce its massive carbon footprint by 25 percent. According to 2011 numbers, the DHS owns 50,000 vehicles (and leases another 8,000), more than the 48,500 FedEx vehicles used throughout the world. This environmentally efficient Forward Operating Base is one of close to 12,000 facilities owned by Homeland Security (with another approximately 2,000 leased), operating both in and outside of the United States. The combined number of facilities was equal to the number of McDonald’s restaurants that were operating in the United States in 2012 — approximately 14,157. Reducing the degree of environmental degradation inflicted by such a massive department, with presence in places seen and unseen across the United States and the globe, is a monumental task. According to the US Green Building Council, the nearby Ajo Border Patrol station was one of the most energy efficient when it was built in 2014 with a “reduced light pollution” system and a “heat island effect” roof and parking canopies, intended to “minimize impacts on microclimates and human and wildlife habitats.” The “water use reduction” system creates a much lower flow of water, though it probably hardly matters in this station in the west Arizona desert that has increased from 50 to 500 agents in a very short period of time. This is sustainable border militarization. Behind the agent at the Forward Operating Base were rows of solar panels, and farther on, a tall surveillance tower, also powered by solar energy. Approximately 25 miles away from this simulated war zone was the international boundary where the Ground-Based Operation Surveillance Systems known as G-Boss, made by Raytheon company, gawk into Mexico through an 80-foot tower. From where I stood I heard not only the sounds of the desert, the distant rumbles of a monsoon thunderstorm that would bring with it the deep smell of creosote, but also the constant noise of sustainable militarization, including the distant buzz of another all-terrain vehicle. All around were what conservationist Cyndi Tuell of the Sierra Club’s Borderlands project calls “assaults on the landscape.” This project has worked for years to advocate for borderlands ecosystems and against environmental destruction in the name of national security. One such assault, in front of my eyes, was a series of chained-together tires, discarded in front of the chain-link fence topped with swirling razor wire that encircled the Forward Operating Base. This was only one bit of evidence of the 12,000 miles of wildcat routes that have trampled the cryptobiotic soil — a thin cover that both holds dirt down and provides fertile ground for the ecosystem — in both the Organ Pipe National Monument and the adjacent Cabeza Prieta Wildlife Refuge in the name of national, and now, we have to say, climate security. This environmental degradation of a US national treasure is facilitated by the fact that the Department of Homeland Security can issue waivers to key environmental and cultural laws in order to install walls, roads, and surveillance technology. To this expanding surveillance state, as with my experience with Nuñez at the Honduran checkpoint, your story does not matter. The reasons you might arrive there do not matter. If Santos Fernando, Ismael, and Luis Carlos are ever caught there, the forms they fill out will not ask about clean water, food, or rain, though Homeland Security itself recognizes that droughts will displace people. If they get caught there, unlike a European tourist out for a hike in the desert, they will be transported by privatized Border Patrol agents working for the high-rolling UK company G4S. Their destination will be a short-term detention facility not unlike those used by the US military in war zones. As researcher Blake Gentry writes, it’s “deprivation, not deterrence.” Many will then be brought in shackles to a federal courthouse, where they will appear before a magistrate judge. It doesn’t matter whether the forces motivating them are ecological, economic, or political, the people walk in groups of five or eight, heads slightly bowed as if forced into a submissive pose. All of these people in the Operation Streamline proceedings in Tucson have been in the Sonoran desert, some near Douglas, some near Nogales, some near Sasabe, and some near the Forward Operating Base on Organ Pipe National Monument, and all have been caught by the US Border Patrol. Operation Streamline represents a zero-tolerance mass sentencing of undocumented border-crossers, and it is poised to become even harsher under the mandate of Attorney General Jeff Sessions. Unasked is the individual story of any of these people. If there are climate refugees in the bunch, you would never know. They have faces, but are faceless. All you see is their chained bodies shuffling up to the judges, the shackles clanking as they go; the only information that matters is where they entered the United States and whether their entry was properly authorized or not. “My infant is four months old and is a US citizen,” he told her. He was born with a heart condition. They had to operate. “This,” he said, “is the reason I’m here before you.” The man tried to gesture with his words but the shackles and chains restrained him from doing so. The magistrate judge responded that she was sorry for his predicament. She told him that he couldn’t just come back here “illegally” and that he had to find a legal way to enter the country. “Your son, when he gets better, and his mother can visit you where you are, in Mexico,” said the judge. “Otherwise he’ll be visiting you in prison. You’ll see how it will be for him — growing up visiting his father in a prison, where he will be locked away for a very long time.” Then she sentenced him, along with the rest of the eight men standing side by side in front of her, to prison terms ranging from 60 to 180 days. Throughout the whole interchange it never left my mind, not even for a second, that his child, the one with the heart condition, was born the same exact month, and maybe even the same exact date, as my own child. His fate is that of the climate refugee, and as predictable as the Category 6 storms of displacement. He will be separated from his family in distress and locked up behind the razor wire of the Corrections Corporation of America — a privatized prison — that will earn $124 per day from his incarceration. Copyright (2017) by Todd Miller. Not to be reprinted without permission of the publisher, City Lights Books. Parts of Antarctica are turning green due to ice melt as Trump and his cronies continue their assault on climate science.